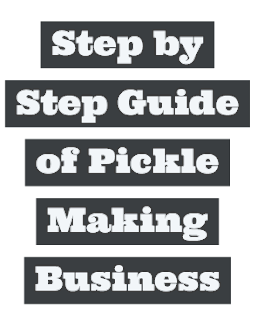 Pickle Making Business is a Small Business Idea with low investment, and it is a very simple process so we can start it easily. Pickles can be made out of any fruits and Vegetables. 1) You must decide which fruits or veggies we will select. 2) We should collect some recipe about pickles. Don’t you worry; you don’t have to buy books for that. Google could be your guide in that matter. As this plan is for tiny business setup. 3) Make pickles at home with collected recipes and don’t forget to include some extra ingredients, it could be spies, herbs, mixtures or anything, these factors could make your pickle different from other available in market. 4) After all sort of test phase is complete, make pickle for sample. Don’t concentrate on different flavor and mixture at first as you are a first timer. You could start your business alone and don’t need to recruit staff. But it could depend on the business volume. 5) Your pickle samples are ready, now it’s time to show some Marketing Skills. If you are not confident enough, you always have the option to recruit a sales people. But if you do it yourself your profitability and business network will increase. Star production only after getting order from any store or shop. Or if you think you could sale it to an end user or customer yourself, than start immediately. Don’t forget, to run these business one must take certification from Government Food Departments.